With the service account configured, login to a Jenkins environment that has the OpenShift Login plugin installed, but is using another security realm. Navigate to the Jenkins overview page and click Manage Jenkins and then Configure Global Security. Once again, select the Login with OpenShift radio button to expose the configurable options. Enter the same values for the OpenShift Server Prefix and OpenShift redirect URL as configured in the previous section. Since the service account that is being used to run the pod is being used to facilitate the OAuth process, no further configuration is required. The OpenShift Login plugin will use the service account that is being used to run the pod as the client id and locate the preconfigured OAuth token that is generated upon service account creation from the file that is automatically injected into each pod. Click Save to apply the changes. Click the log out link at the top righthand side of the page trigger a new OAuth flow. Enter your OpenShift username and password when the OpenShift login page is displayed and click Login. This time, you are presented with a prompt as to whether you want to trust the jenkins service account to access account information on your behalf. This is a similar process that you may have encountered on other web sites, such as Facebook, when utilizing third party applications. You are also presented with the types of permissions the service account will attempt to utilize. 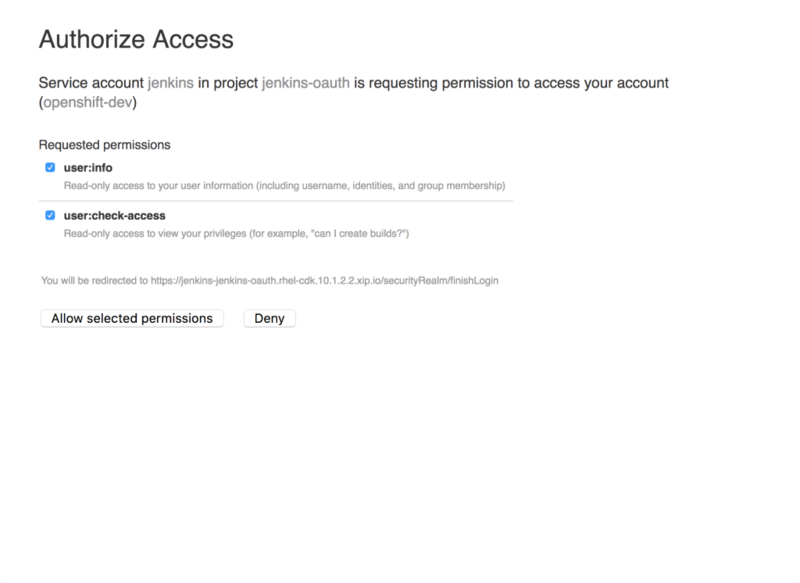 After reviewing the details, select Allow selected permissions which will allow the OAuth process to continue and upon successful authentication, the browser will be redirected to the Jenkins homepage. The inclusion of the Jenkins OpenShift Login plugin is another example of the continued effort to integrate more systems and applications with the OpenShift ecosystem. Continuous Integration and Continuous Delivery have become the framework for how organizations iterate rapidly and deploy software in a repeatable manner and it is only natural that the OpenShift Container Platform provides a deeper level of integration with one of the most popular Continuous Integration servers on the market. The entire installation and configuration of the Jenkins OpenShift Login plugin is expected to be streamlined once it and the corresponding Jenkins image from Red Hat are officially bundled in a future release of OpenShift. The majority of the functionality to enable the dynamic capabilities between Jenkins and OpenShift is through the use of several Jenkins plugins. Plugins can be installed in Jenkins by logging onto the master web interface and selecting the Manage Jenkins link on the lefthand side, and then selecting Manage Plugins.